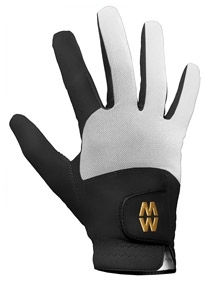 MacWet's original mesh glove, developed for warmer weather, has been specifically designed to aid circulation of airflow around the hand. MacWet's unique Aquatec ® fabric responds to moisture and climate change, giving maximum grip, sensitivity, feel and comfort at all times, no matter how wet or humid. Check your glove size for the ultimate fit! 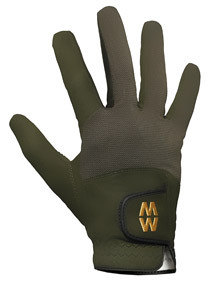 As the synthetic fibres used in MacWet gloves have natural wicking properties, they allow any water to be readily transported around and over the gloves surface to the fabric face. This means any water evaporates quickly, providing you with the optimum amount of comfort and gripping power! Unlike perspiration inducing leather gloves which compromise comfort and grip, the fabric used in these gloves allows the hand to breathe, ensuring a consistently comfortable grip. Want to enhance your performance further? Add a little moisture to the glove by clasping a damp towel to give maximum grip, whatever your sport. To ensure your glove fits like a second skin, take a tape measure and measuring in centimetres, place the tape measure across the fleshy bit of skin just under your four fingers to give you your size. 7cm (size 7) is considered a medium women’s size whilst 8cm (size 8) is considered to be a medium man’s size. Washing by hand or machine at 40 degrees will help ensure that glove performance is kept maximised. Whatever your sport or activity, you don’t have to compromise on comfort or grip ever again with these MacWet gloves!